Every single day, tens of thousands of people travelling on Lougheed Highway and the Millennium Line in Burnaby pass by a fusion reactor project – and the odds are that most aren’t even aware of its existence. General Fusion, located at a state-of-the-art facility next to Production Way-University Station, is ever closer to developing a functional fusion reactor that can be used to generate clean, abundant, and affordable energy. It may sound out of this world, but the technology is no longer the stuff of science fiction. In fact it could only be a few years away from becoming an reality, and if everything goes as planned, Canadian scientists in Metro Vancouver could be responsible for heralding in a sustainable energy revolution. The company’s reactor prototype does not carry any risk of melting down like nuclear power plants, and it is also deemed clean by using only a small amount of Deuterium – weak radioactive fuel that is commonly found from extracting it in sea water. The heat generated would be used to create steam to turn the turbines that generate electricity. However, the process required to create an output energy – through the combination of hydrogen atoms to form helium – is immensely difficult given the need to heat the reactor core’s plasma to 150 million˚C, which is basically equivalent to an artificial sun. One of the biggest obstacles with the technology at this point is with how the plasma in the fusion reaction is to be contained. There are some various on two other competing projects elsewhere: The ITER project in France uses an array of magnets to heat and compress plasma while the National Ignition Facility in Livermore, California aims laser beams at fuel pellets, which creates radiation that compresses the plasma and fusion reaction. However, both of these projects would need an incredible amount of input energy and the technology required is highly complex, to the extent that such fusion reactors will likely cost of billions of dollars. As well, both technologies could still be more than 30 years away. This is where General Fusion’s design comes in. It uses a hybrid technology with less-powerful magnets and a series of steam-propelled pistons that compress the plasma contained inside a spherical vessel to generate the fusion reaction. The company believes its technology can be developed much more quickly and at just a fraction of the cost of other technologies. General Fusion was founded in 2009 and currently employs 60 people. It has secured over $100 million in public and private investment, including $27 million from the Government of Malaysia, $19.5 million from Amazon CEO Jeff Bezos, and $20 million from other levels of government in Canada. Earlier today, the Canadian federal government announced that it would be investing another $12.75 million into Green Fusion’s project. As well, $3.1 million will be directed to Inventys Inc., another Burnaby green tech company that is inventing a way to separate carbon dioxide from other gases when fossil fuels are burnt during the combustion process. “Canadians understand that a strong economy and a clean environment go hand-in-hand,” said Navdeep Bains, the federal Minister of Innovation, Science and Economic Development. 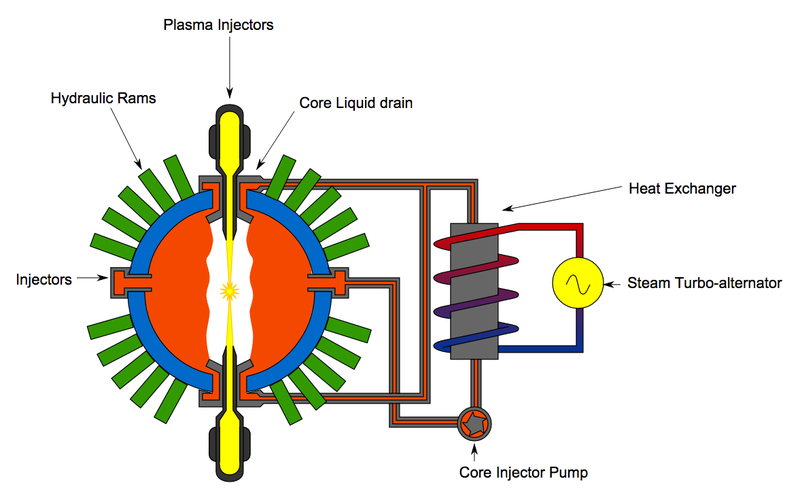 Diagram of General Fusion’s fusion reactor.